Visitors can only play on Tuesday and Thursday with a maximum of 12 players in each group application, plus a certificated handicap of 18 or less. Lady golfers may only play if accompanied by a gentleman player and their handicap limit is 24. The morning format is fourball starting on the 10th tee, twoball starting on the 1st tee. The afternoon is foursomes only. he original course was designed by Old Tom Morris and 16 holes built by hand and horse were opened on 3rd May 1891, with two more added in December. 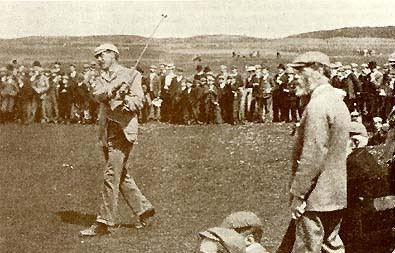 Sir Alexander Kinoch performed the opening ceremony by driving the first ball, teed up by Old Tom Morris in the pouring rain. Muirfield was the first course designed in two loops of nine holes, the first nine going round the perimeter of the property in a clockwise direction, the second nine contained inside the first, running anticlockwise, and since never more than three successive holes run in the same direction, any wind that blows afflicts the golfer from all points during a round. Muirfield is home to the Honorable Company of Edinburgh Golfers who held their first meeting on Leith Links in 1744. The clubhouse was built in 1768 on the south west corner of Leith Links on the site now occupied by Academy Lofts on Duke Street. The Honorable Company fell into financial difficulties in 1831 and the clubhouse was sold for £1130. The present building was constructed as a new secondary school for the increasingly overcrowded Leith Academy next to the artificial mound known as 'Mount Somerset' said to have been built as an artillery battery in 1560 during the Siege of Leith when Mary of Guise supported by a large French garrison was attacked by an alliance of Scottish Protestant lords and an English force. The Links at that time were also shared by the local citizens and although it was public ground, the Honorable Company employed men to tend the ground and was therefore the first Club to maintain it's own golf course. The Honourable Company of Edinburgh Golfers is recognised as the world's oldest golf club, although the Royal Burgess Golfing Society was formed in 1735, and also played over Leith Links, but has no documentation to substantiate this date due to the nature of the secrecy of the freemasons who founded the society. In 1744 the first 13 rules of golf were drafted by a committee, including John Rattray, the first captain of the Gentlemen Golfers of Edinburgh, subsequently to be known as the Honourable Company of Edinburgh Golfers. The Thirteen Articles were adopted almost word for word ten years later by the St. Andrews Society of Golfers, later to be known as the Royal and Ancient Golf Club of St. Andrews. To mark the creation of the club, Edinburgh Town Council presented the Honourable Company with a Silver Club to be contested for by the members, thus was born the first club competition. Muirfield Score Card In March 1744, John Rattery was the first winner, he was also a past archery champion on Leith Links. In 1745, Rattery was brought into service as medical surgeon to Bonnie Prince Charlie's army camped in Edinburgh. At Culloden he was captured and imprisoned but fellow member of the Honourable Company, Duncan Forbes then Lord of Session secured his release. Although Forbes and Rattery were on opposite sides during the Jacobite rebellion they were back playing together for the Silver Club in 1748 which Rattery won, and again in 1751. Originally the winner of the Silver Club became captain, a practice that ceased after 1837. Today the winners name is engraved on a silver replica golf ball of the day, which is attached to the silver club shaft. The event was matchplay since strokeplay was in its infancy and was played over Leith's five-hole layout. A forbidding test with holes measuring 414, 461, 426, 495 and 435 yards, respectively. The long game was the thing in those days, putting did not play such a dominant role until the invention of the mechanical mower. After their game of golf the members gathered for refreshments in Hugh Moir's Tea, Wine and Spirit Merchants at 53 High Street, Musselburgh. In 1865 the use of the gutty ball for the Silver Club competition was made compulsory and that was the official end to the feathery ball. During the late 18th century as Edinburgh expanded, Leith Links became overcrowded and the Honourable Company of Edinburgh Golfers decided in 1836 to move to the nine hole course beside the race track at Musselburgh. 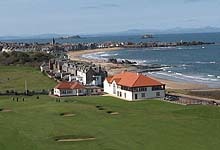 This ground was shared by a number of other golf clubs and the Honourable Company would also play the West Links at North Berwick during the summer months. Again overcrowding at Musselburgh forced them to move further down the coast to another race track at Archerfield Estate owned by the Rt. Hon. Nisbet Hamilton. The ground was once used as a racecourse known as the Hundred Acre Park which formed part of the farm of Muirfield and where the East Lothian race-meeting was held annually. The Honourable Company regard matchplay as the true and proper expres -sion of the game, and Foursomes as the epitome of all that is best in golf. Mr. B. Hall Blyth is credited with securing the transference of the Honourable Company of Edinburgh Golfers from Musselburgh to Muirfield. He carried through the arrangements for the lease of the property and in recognition of his services was given the honour of playing the first match on the course. This was emphasised by his being pitted single-handed against Mr. A. Stuart and Mr F. V. Hagart. Benjamin Hall Blyth was an engineer by profession and a consultant engineer to the North British and Great North of Scotland Railway companies. He was associated with the reconstruction of Waverley station at Edinburgh, the rebuilding of the Tay Bridge and the expansion of the North Berwick branch line to include stations at Aberlady, Luffness and Gullane. He was a life member of the Royal and Ancient Club and his name will always be associated with the acquisition of the Braid Hills as a municipal golf course by the citizens of Edinburgh. Muirfield was opened on Saturday 2nd May 1891 in unfavourable weather conditions with rain showers throughout the day. In the afternoon about 130 members and guests sat down to luncheon in a Marquee erected on the ground with Captain Colonel Anderson presiding. 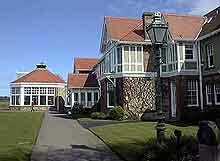 The new clubhouse was opened on Saturday 5th Dec. 1891. The name Muirfield is shown on Roy's map of 1754, and derives from a period when it was the practice for the tenant farmer to identify each field with a descriptive name. The word 'muir' in Scotland means a track of unenclosed and uncultivated land often affected with marshy areas. During the 1892 Open played over the new links at Muirfield, still in primitive condition, the course was described by the sardonic professional Andrew Kirkaldy as 'an auld water meadow'. Which aptly reflects the name originally given to this track of land called the 'muir-field'. In 1893 access to the Muirfield Links was from Drem Station, a walk or drive of 4 miles. The rail ticket from Edinburgh to Drem Junction was 1st class return 5s 4d and 3rd class 2s 11d. George Fitzjohn was the clubmaster for the Honorable Company at Musselburgh and in 1891 he moved with the Club to their new location at Muirfield. His sons, Frederick, Edward, and Valentine Fitzjohn were successful golf professionals and clubmakers in America. During the 1896 Open Championship at Muirfield, seventeen professionals stayed in Hopefield Private Guest House on the Main Street, Gullane. Including J. H. Taylor, Alex Herd, Willie Fernie, Rowland Jones and Willie Auchterlonie. Hopefield House was organised by Alexander Gillam and the remainder of the competitors stayed in the Golf Hotel in Aberlady. In those bygone days curling and golf where old allies and the Muirfield Links was also the site of the Dirleton curling pond used by the neighbouring villagers. The outline of the banks and bed of the pond can still be seen north-west of the seventh fairway where a supply of water ran into a narrow drain which they used to flood when the frost came. On this pond the farmers in the district and the members of the Honourable Company held their curling tournaments. Henry Buchan was appointed clubmaker to the Honourable Company at Musselburgh. In 1892, James H. Hutchison was appointed club and ballmaker to the Honourable Company at Muirfield with his timber workshop adjacent to the clubhouse. That year Muirfield hosted the Open Championship for the first time when the amateur Harold Hilton lifted the claret jug. To attract more players the prize money was increased from £28.10/- to £110 and the entry fee was 10/-. The first greenkeeper at Muirfield was Davie Plenderleith from North Berwick who followed the design staked out by Tom Morris. Bobby Brown was also a green keeper before moving to Troon. In 1901 the second hole was lengthened to avoid the danger of driving into players on the putting green. The seventeenth, originally a blind hole was particularly dangerous as the putting green was on a slope within reach with an iron club from the tee. A new green was laid well to the right beyond the former green which then necessitated a new teeing ground and line for the eighteenth hole. Head greenkeeper Alex Gow and his staff carried out the alterations forming the present seventeenth and eighteenth holes which have seen so much drama over the years. In October 1899, Jimmie Sheridan the regular caddie for John Laidlay was hired by Freddie Tait at Gullane Station which was Tait's last recorded round of golf at Muirfield before returning to his regiment in South Africa. He was killed on 7th February 1900 at Koodoosberg Hill during the Second Boer War. In 1901, the Open Championship was played at Muirfield on the 5th and 6th June. Two rounds were played each day with any competitor 20 strokes behind the leading score at the end of the second round was compulsorily retired. The winner was James Braid (229) who received the Championship Gold Medal, valued at £10 and £50 in money, while Harry Vardon (234) in second place received £20. The Honourable Company organised the Open Championship until 1919 when the day to day running of the event was handed over to the Royal & Ancient Golf Club. Robert Maxwell a former Amateur Champion and captain of the Honorable Company persuaded the members to purchase another 50 acres of ground to the north of the property and invite Harry Colt to remodel the course in 1923. 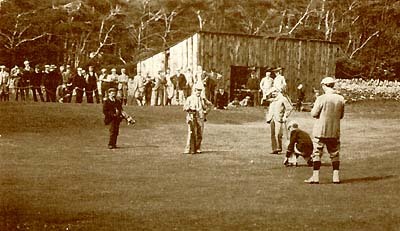 Many historians are convinced that Muirfield did not become a truly great course until Harry Colt, and Tom Simpson were brought in to make the changes in 1928.
in the white boots with his back to the camera. he re-modeling of the 13th hole in 1935 was the last substantial improvement until 2011 when golf course architect Martin Hawtree was involved. Hawtree heads the family course-architecture firm started by his grandfather. Some greens were extended to provide more championship pin positions, and the new layout also introduced six new championship tees to extend the course to a total of 7245 yards. The first hole at Muirfield (447-yards) is one of the toughest opening holes on any championship course. To the left of the narrow fairway is one of many large bunkers which dominates the player's thoughts. Bailing out to the right is not an option with severe rough, so an accurate drive is essential. At the 1966 Open Championship, Doug Sanders remarked about Muirfield's knee-high rough and said he didn't mind so much about winning the championship as long as he could have the hay concession. The biggest challenge is the four par-3s with raised greens, making them a tight target and a missed shot will inevitably end in a deep bunker. The 226-yard fourth hole, surround by four bunkers is a particularly difficult test. The 184-yard seventh is similar to the fourth but runs in the opposite direction, into the prevailing wind and offers an exposed elevated green guarded by four bunkers. Jack Nicklaus regards the 190-yard 13th as a great par-3. It runs uphill to a narrow green with deep bunkers on both sides. The final par-3 is the 186-yard 16th with seven bunkers to contend with and the slope gathers any shot played to the left side into the traps. In addition to the short holes, Muirfield demands accuracy everywhere else, especially on the 461-yard, par-4 sixth, which dog-legs to a split-level fairway. The 441-yard eighth has 12 bunkers and starts a run of three very challenging holes. The biggest change is on the ninth, where a land swap with neighbours the Renaissance Club has allowed the tee to be moved back almost 50 yards, extending the par-five to 554 yards with a new bunker on the right of the fairway and bunkers moved closer to the green. This has tightened the fairway with out of bounds on one side and two bunkers on the other. Muirfield remains the No1 golf course in Europe, measuring 7245 yards S.S.S. 71. with no trees or water in play, none of its subtleties are hidden or even disguised, only one blind shot, the drive over the ridge at the 387-yard 11th hole. The outstanding feature is the bunkering, faced with revetted turf, gritty sand from the adjacent beach and as tall as a man stands. The course is maintained by Colin Irvine, the course manager for the past 19 years and his staff of 12 green keepers. In 1949, James Logan was appointed head green keeper. He was the son of William Logan the green keeper at Gullane Golf Club. James Logan (1949-80), was followed by David Kirkcaldy. In 1987 Davie retired and Chris Whittle from St Andrews Links was appointed. In 1981 Colin Irvine started as a green keeper at Muirfield when he was 16 years old. After the 1992 Open Colin moved to a course in Dusseldorf, where he remained for two years before returning to Muirfield as course manager in 1994. The Open has been played at Muirfield 16 times, the Walker Cup twice, the Curtis Cup in 1984, Ryder Cup in 1973 and the Amateur Championships 10 times, the most recent in 2010. Henry Cotton won his third Open title in 1948, Gary Player won in 1959 and Jack Nicklaus in 1966. Every hole has a story to tell such as the par-4 second where a 19 year old Jack Nicklaus nearly drove the green in a practice round for the 1959 Walker Cup. The long fifth, on high ground along the north edge of the property, is where Johnny Miller holed his second for an albatross two during the 1972 Open. The eighth where Walter Hagen cut the corner of the dogleg twice on the last day, and where bushes were planted to prevent a repeat of his short cut to the green. The lovely par-3 13th, where Ernie Els played a miraculous bunker shot up a near-vertical face, to 18 inches, in winning the 2002 Open. The 15th, with the green the members call the Camel's Back to which Nick Faldo hit 'one of the best shots of my life' in the 1992 Open. Perhaps the most dramatic Open in Muirfield's history came in 1972 when Lee Trevino holed his famous chip shot from the edge of the 17th green and in the process stole the title from Tony Jacklin. Tom Watson won in 1980, Nick Faldo 1987 and 1992, Ernie Els in 2002 and Phil Mickelson in 2013. In 1926, Bobby Jones entered the Amateur Championship at Muirfield and stayed in the Marine Hotel in Gullane. The Hope's of Luffness built the Marine Hotel (former Scottish Fire School) next to the railway station in 1900. Jones hired a local caddie Jack McIntyre, a coal miner from Well Wynd, Tranent, East Lothian.They struck up a working friendship and the following week McIntyre caddied for Jones in the Walker Cup international match at St Andrews. Despite Jones being defeated in the Amateur Championship, Jack McIntyre wanted to caddie for him at the Open Championship at Royal Lytham & St Anne’s to show everybody how good Bobby Jones really was. Two weeks later McIntyre travelled to St Anne’s at his own expense and Jones was delighted to see him. Another connection with East Lothian was Jack White the professional at Sunningdale. After practice at St Anne’s Jones headed south to Sunningdale, Berkshire for the Southern Section qualifying rounds for the Open. While visiting the pro's shop Jones picked up a beautifully crafted driver made by Jack White. Using his new driver Jones shot 66 in the qualifying round which he described as the 'greatest round of golf he ever played'. Bobby returned to St Anne's and joined his caddie Jack McIntyre at the Majestic Hotel. The new driver seemed to inspire him into winning the Open Championship and he never used any other driver in competition, wining 10 Majors with it. The driver made by Jack White is on display in the Trophy Room at Augusta National Golf Club. Jack McIntyre's fellow caddie at Muirfield was Jamieson Hogg who was drawn to caddie for Jess Sweetser of Siwanoy Country Club, the eventual winner. Sweetser was the first American-born player to win the Amateur Championship. Hogg studied the violin and was described as a skinny little red-headed freckled faced boy from Ormiston a mining village a 12 mile cycle ride from Muirfield. During the Second World War Jamieson Hogg enlisted with the 7th Royal Tank Regiment R.A.C. and was posted to the Middle East. He was killed-in-action on 20th June 1942 aged 30 years and his name is engraved on the El Alamein War Memorial, Egypt. Jack Nicklaus was 19 years old when he played Muirfield for the first time as a member of the 1959 Walker Cup Team, and has become one of the course's greatest ambassadors ever since. Over the years the City of Edinburgh has presented four Silver Clubs to the Honourable Company, a fifth was gifted to Muirfield Village in Ohio at their opening ceremony in 1974. Unlike most golf clubs, Muirfield does not have a professional's shop. The reason given is that the majority of the members of the Honourable Company are also members of another golf club closer to their home, where they can use the facility of their local professional. Today the visitor traffic on the course could sustain a resident professional, but the Honourable Company has decided not to provide a commercial outlet. In September 2013, Alistair Brown retires as secretary when Stuart McEwen takes over. He was a former director of golf at Gleneagles and Kingsbarns. From Edinburgh take the A720 City By Pass (South) - follow sign post Berwick-Upon-Tweed (A1). Continue on A1 (South) take the A198 - sign post North Berwick. Pass through the villages of Longniddry, Aberlady and Gullane. On leaving Gullane, Muirfield is accessed from the last exit on the left - sign post Greywalls Hotel. Drive time from Queensferry Crossing and Edinburgh Airport 45 minutes. From the A1 motorway take the A198 - sign post North Berwick. Continue through North Berwick for 5 miles on the A198 - sign post Edinburgh. Muirfield is accessed from the first exit on the right when entering Gullane - sign post Greywalls Hotel.